Early Monday morning, the first rainfall Jeju Island has seen in nearly a month signaled the kickoff to the annual peace march against the naval base. For the second consecutive year, this walking demonstration allows the community to come together for a common cause. Children, students, parents, and seniors alike gathered in Gangjeong Village on Monday, and nearly 500 passionate, peace-loving Koreans and internationals took off to walk the ambitious 132 miles around the island all the way to Jeju City. Two teams going either east or west have been marching day and night in the harsh heat of Jeju’s summer – each side will walk nearly 70 miles to meet at the north point of the island in Jeju City. Along the way, children in school buses and seniors in neighborhoods wave and shout words of encouragement at the sight of hundreds in yellow shirts carrying flags that say “No Naval Base” and “Peace and Life for Gangjeong Village.” From the highway to the countryside, participants in the march walked fearlessly, occasionally singing and dancing to the songs of peace known by all those who have been part of the struggle. Since the debate around the naval base began seven years ago, activists of Gangjeong Village have made music to express their love for peace and for Gangjeong village; this music plays throughout the march for participants and passing residents to enjoy. With a nurse following the march to treat blisters as well as an acupuncturist available at the end of each long day, participants have stayed strong throughout the march. With pep in her step, an 8-year old girl walks with her mom for the second year in a row, and along the way, she dances to her favorite songs on the soundtrack. Many organic farmers also join with their children to demand environmental justice and peace for Jeju Island. Middle school students go the extra mile to put flyers on parked cars and talk to store owners of passing neighborhoods. Among the diversity of the marchers and the sense of dedication throughout the hours of walking, you can sense that this is not an issue specific to Gangjeong – nor is this an issue specific to demilitarization, agriculture, or environmental protection. The construction of a naval base is detrimental on a global level; political, economic, ecological, and psychological instability are imminent if the base is constructed. From the propagation of war, the destruction of irreplaceable ecosystems, the extinction of endangered species, and the inevitable loss of culture and quality of life, it is clear why organizations, celebrities, and activists across the world have condemned the idea of further militarization. The protests for the past seven years as well as the annual Peace March epitomize nonviolence. With the east and west teams of the march joining tomorrow afternoon and marching to Jeju City as one, community members from all over the island are expected to attend. Oliver Stone will be speaking at the concert that starts at 6pm, and the energy as well as feelings of empowerment and accomplishment will surely be a sight to see. Loud and proud, 132 miles will have been traveled this week. 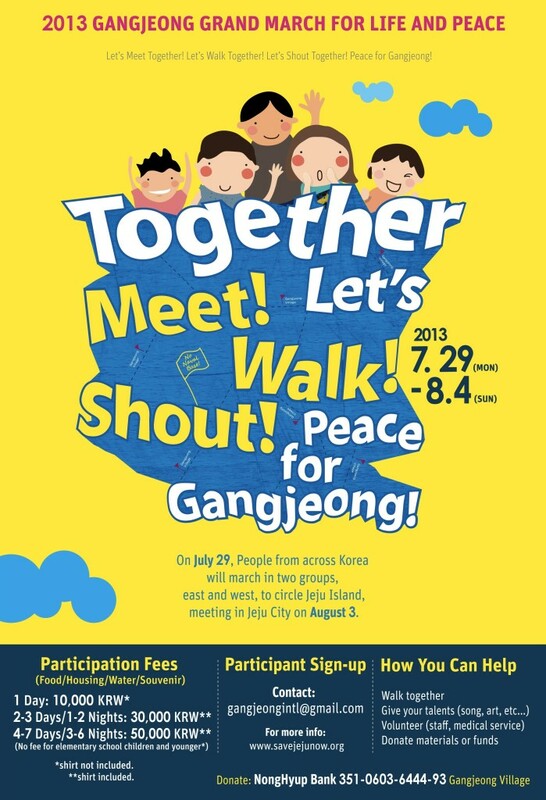 The human chain for peace will be on Sunday, August 4th at 12 noon around the construction gates and port at Gangjeong Village. 1,500 people are expected to join.See the picture gallery below, shot with the East side team from Monday to Thursday of the march. and perform songs of peace! If you watch the video (made in 2011), note that after nearly two years of additional construction, the coastline of Gangjeong Village looks drastically different. Much of the view is obstructed by concrete and construction cranes, trucks, and ships. The sacred rocks of Gureombi have been taken over by the construction, indicating the loss of an immensely spiritual site for villagers.